Almost a month after he returned home to Colombia, Mauricio Soler has said that he is making strong progress in his return to health. The Movistar rider, who celebrated his 29th birthday yesterday with his family, has been doing physical therapy in the Teletón de Chía clinic and believes he’s moving forward well. Soler was riding strongly in the Tour de Suisse last June, winning a mountain stage and sitting second overall heading towards the end of the race. However he crashed soon after the start of the sixth stage, and suffered a head injury plus brain trauma as a result. He also had multiple fractures and hematomas, and was placed in a medically induced coma. In July it emerged that he was suffering from what was termed ‘serious cognitive defects,’ with the rider being able to move at that point, but not being capable of speech. 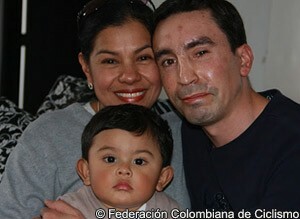 Since then things progressed; in mid-October he was released from the University Hospital of Navarra and allowed return to his Spanish home, then in December he was sufficiently well to fly back to Colombia. He spoke to reporters there and while his voice was quiet, he was clearly able to communicate. Five months after being unable to talk, it was a sign of how he had progressed. Soler’s most recent statement doesn’t mention if he is considering a return to the bike or not. His aim is to get his health back, then see how things stand. However his assertion that he is making steady progress is good news for the rider and for those who support him. The former polka dot jersey winner has some mountains to climb but, judging by his indications, it appears he’s moving steadily in the right direction.